Spring is finally here, and with it comes longer days. More daylight means more fun, even in the working week, and with a warm summer being predicted, it’s never been a better time to plan for those extra hours! 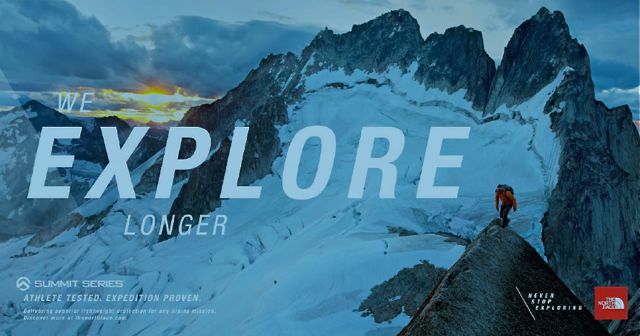 The North Face have launched a new campaign in line with this called #LongerDays. They also believe that regenerating the connection with the outdoors on a regular basis is key to a healthy lifestyle, and with the extra hours of light, want to get YOU involved. So how can you get involved with #LongerDays and why? The North Face will be running the “Explorer Photo Competition” and will be awarding daily prizes. Now that’s a great incentive! Not to mention that getting outdoors is also great for the body and mind. You can follow the campaign on Facebook, Twitter, Instagram or visit their official website to find out more. There is also an App called the “Explorer App” where you can build yourself a profile and share your photos and adventures. Or if you like just sharing your adventures with others, then this is for you. What I like about this campaign is it’s very simple really, but being inspired by others to go on new adventures is so important. I think this campaign will do just that, and is one of the reasons I will be taking part myself! Some of my best memories in the outdoors have been on those warm summer evenings as the light starts to fade, it’s a fantastic time of the day, so lets not waste it!